Do you think love can't be controlled? 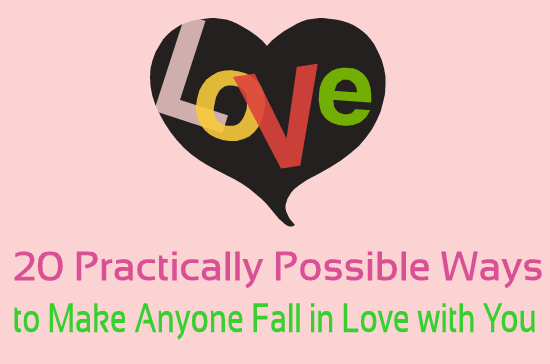 Do you think love is a process that happens randomly and that can't be controlled? The good news i have for you is that there are strict rules that guide the process but your only problem was that you were never aware of them. By learning how to apply these rules correctly you won't just understand why you fall for certain people but you will also be able to make anyone fall in love with you. 2) Show that you are not like the past Ex Most people change the criteria they are looking for in a potential partner after a messed up relationship. When you show someone that you aren't like the last mean person he was with you will have a superior advantage over others. 3) Understand the person's psychological needs: Each person has different psychological needs and the best match for him would be the one who can satisfy most of these needs. 4) Raise your value: Let common friends talk about you in a great way in your absence. People start to think that someone is more valuable when they find that others value him as well. 5) Show up more often: Studies have shown that people choose a relationship partner from among the ones they meet often. The ones who disappear for prolonged periods of time usually get forgotten. 6) Be mysterious: The less your intentions are understood the more will people think about you and the more someone thinks about you the more likely he is to get attached to you. 7) Smile often if you are a woman and less often if you are a man: Studies have shown that men prefer approachable women and get turned off by intimidating ones while women prefer tough looking men over nice guys. 8) Let the person realize how similar you are to each other: Whenever you find something common about you both point it out (provided that its a good trait). If few similarities can be found your target might start to think that you should be together. 9) Disappear when you are missed: When your target misses you Disappear without giving reasons. This will let him think about you even more and speed up the attachment process. 10) Confuse your target: Don't always be nice and don't always be unfriendly but shift your strategy accordingly in order to confuse your target. People think more about the things they can't fully understand. 11) Excitement can be confused for love: When you do an extremely exciting activity together (like watching a great movie or even climbing a mountain) the excitement felt can be confused for love and your target might think that he is excited because you are around. 14) I am Exclusive for you: Show your target that you have many other options and that you favored her/him over them. 15) Match their body language: When you mimic someone's body language and tone of voice he will unconsciously believe that you are similar to him (provided that his conscious mind doesn't notice you are mimicking him. 17) Display the opposite traits: Display the opposite traits of the ones your target doesn't like about himself. If your target is shy for example then acting confidently and in an extroverted matter will make you more attractive to him. 19) Call at a fixed time each day then stop all of a sudden: When people keep anticipating something and it never happens they think about it even more. The more someone thinks about you the more likely he will get attached to you. 20) Understand the person's past: Based on his past experiences your target might have came up with a love map that determines the type of people he gets attracted to. By matching the items in this map you can make sure he will fall for you.